If you are - or know - a differently-abled person, then you know that simple things like going out for dinner can be a big challenge in India where accessibility isn't very high on the priority list. Most of our streets and public transport aren't maintained keeping the differently-abled in mind, and the majority of our buildings don't have basic amenities like ramps, braille signage, and so on. 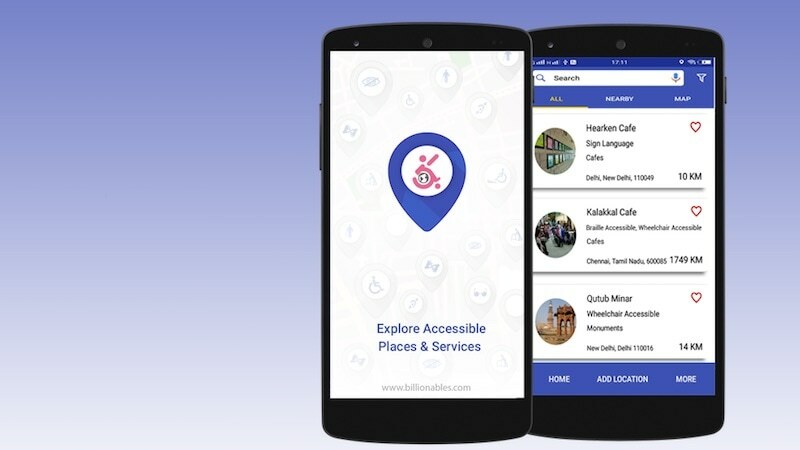 A recently launched Android app called BillionAbles wants to take on the issue by making it easier to find venues that are accessible, and to share information of this sort with other people as well. The design of the app is also fairly barebones right now, which makes figuring out the different navigation options a little less user-friendly than would have been ideal. Still, if you are a person who requires such information, then the ability to get all this at your fingertips is a good start. Much of the information in the app has been crowdsourced. When you launch the BillionAbles app, it simply shows you a list of all the different venues that people have added to its database. The venues range from amusement parks to restaurants to ice cream parlours to public transport, and there are many more categories that don't have entries yet, but show the overall scope of the idea, such as washrooms. The app also allows you to track a number of different accessibility features - such as wheelchair accessibility, Braille, Sign Language, and so on. Most of the listings we saw mentioned wheelchairs, though there were some, such as the Mysuru Railway Station, for example, which mentioned Braille. Other categories in terms of accessibility include gluten free food, which none of the entries mentioned. Of course, since this is a crowdsourced list, the data will only improve once people start using the app - for example, some of the restaurants that are listed under the wheelchair section, also serve gluten free food, so once more people start using the app, that will get added to the listing, hopefully. The home page of the app is the search interface where you can look for venues and accessibility features, but aside from that, you can also swipe to the Nearby screen, where you'll see places from BillionAbles' database that are near you. Or you can swipe again to move to map view, where you'll see a Google Maps view with all the locations marked on the map. This way, you can look around your neighbourhood and figure out what options will be easy and make plans accordingly. At any point, you can also add a location to the map, as we mentioned above. When you tap the Add Location button, you have to enter the address, and other details, and then add it to a category, and add the accessibility features as well. You can also add a review of the place. Fittingly enough, there's an accessibility page in the app as well, allowing you to customise the font size, colour, and contrast settings. All of this comes together to provide a service that many people will find useful, but also, one that's still got a fair amount of room for improvement. The layout of the app makes some of the features less than obvious, and adding places - which is clearly going to be an essential feature if the database it to become comprehensive enough - in particular needs to be streamlined to allow people to quickly and easily add details for others to see. On the other hand, being able to see all the accessibility details at a glance, along with the contact information of the hotel or restaurant, so you can call up and ensure that your needs are properly met, is a big thing as well, and if this is an issue you've faced, we'd definitely suggest giving the app a try. BillionAbles is available free on Google Play. product Need to find a venue that's wheelchair accessible, or has braille signage? This free Android app wants to make that easy for anyone.